This whole grain cinnamon raisin bread is made with spelt and is relatively simple as far as yeasted breads go! Good 100% whole grain bread recipes aren’t that easy to come by. And most of them can be a bit fussy. But this cinnamon raisin bread? It’s just as easy as a recipe made with white flour! There’s no soaker and no biga required, cutting way down on prep time. I tried making this with whole wheat flour and it didn’t work out. When you use spelt, it makes things a little tricky. Spelt requires less moisture than wheat, but the question is exactly how much less to use. I’ve read that you should use 10 – 25% less less liquid when using spelt and I know a 15% differential doesn’t sound like that much, but in bread baking it seems to be. I sub whole spelt for whole wheat all the time in non-yeasted baked goods and haven’t had a problem. It’s just in yeasted bread that I have this issue. So I was extremely excited when I found a recipe on Sonya’s page already calling for whole spelt. My changes were to add more cinnamon because I wanted more of a cinnamon taste and less of a spelt taste, and to give it a cinnamon swirl. You could leave that out if you really want to, but it makes the bread so much more fun and tasty. And whose morning doesn’t need some more excitement?! I don’t know what’s up with German dry yeast, but I haven’t had much luck with it. And neither have my American bread baking friends over here. For this loaf, and all my other yeast breads, I’ve been using a two pound bag of active Red Star Yeast I bought at Sam’s or Costco three years ago. It was only about $4 at the time so it was an amazing value. And one important thing to note: With most of my recipes, you can’t tell that they’re whole grain. You can with this whole grain cinnamon raisin bread but that’s not a bad thing if you actually like whole grain goodies! Just letting you know because this might be a difficult one to sell to the whole grain haters. In a large bowl, mix together the yeast, warm water and honey. Proof for 5 minutes. Add the oil, 1 1/2 cups flour, cinnamon, salt and raisins. Mix with a hand mixer until well combined. Cover the bowl with plastic wrap and let the dough rise for 30 minutes or until doubled. Add more flour, 1/4 cup at a time, just until the dough comes together. I used about 1 1/2 cups in this step, meaning I used 3 cups in the entire recipe. Mix the dough on low for 3 minutes. The dough should be just slightly sticky, but not so sticky that you can't work with it. Spray an 8 x 4" loaf pan with cooking spray. On a floured clean surface or a Silpat, roll the dough into an eight inch square. Sprinkle the sugar and cinnamon evenly over the surface. Roll into a tight loaf and place in the prepared loaf pan. Spray the plastic wrap you used to cover the bowl with cooking spray and use this to cover the loaf. Let the dough rise for 30-60 minutes in a warm place or until doubled. Preheat the oven to 350 degrees F (175 degrees C) and bake the loaf for 30-40 minutes. It should be golden brown and when tapped, it should sound hollow. Let the bread cool in its pan for 5 minutes before turning it out onto a wire rack to cool completely. 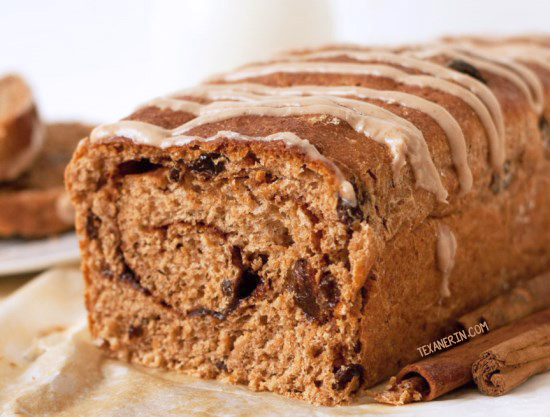 79 comments on “Cinnamon Raisin Bread (vegan, dairy-free, 100% whole grain)” — Add one! Is it possible to cut the loaf before baking to rolls and just bake them like that? Thinking about 9 pieces for a 9×9 square pan. It’s been many years since I made this (I can’t eat gluten anymore) but I think the dough may not be firm enough to form into rolls. I could be wrong, though! Sorry I don’t have a more helpful answer for you. Would it be ok to use sprouted spelt flour in this recipe? Hi there! I don’t have any experience using sprouted spelt so I’m not sure. I’ve just started using sprouted oats and finding that things come out denser than with regular oats, so I really don’t know. Sorry about that! Why won’t my mix double/rise?! Not sure what I’m doing wrong. Is in a warm area covered but no change! This looks fantastic! I’m new to bread making and wondering if I’d be able to use my Kitchen Aid hook instead of the hand mixer? If so, would I let it mix for a shorter amount of time? Thanks for sharing this recipe by the way! I made this recipe today. I am so pleased with the outcome. The bread turned out perfect. I didn’t change a thing. I will be making this recipe again and again! I made this yesterday – it is DELICIOUS!! I’m just wondering how to store it? I imagine with the sugar to put it in the fridge? And if so, how long will it last? Thank you! Hi there! Sorry for just now seeing your comment. I’m so happy that you enjoyed the bread! It can be kept wrapped up at room temperature for up to a few days. Thanks for your comment and sorry again for the slow reply! Love this! 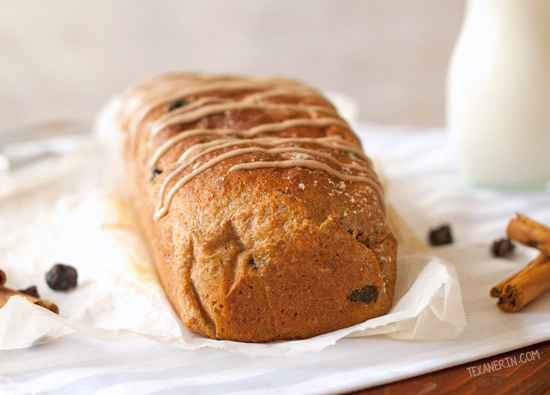 It looks delicious but is way healthier than traditional cinnamon raisin bread. I’ve never baked with spelt flour, only whole wheat and almond flour. I’ve been wanting to experiment with different flours, I actually just bought coconut flour. I’m going to add spelt four to my list. Thanks! I’m so sorry I just now saw your comment! I don’t know how I missed it. And I’m so excited that you bought or will buy some spelt! It’s really awesome in this bread. :) I hope you’ll get to try it out! Thanks for your comment and sorry again for the slow reply. I just wonder if raisin mean they are dries raisins or fresh ones? Haha. That’s awesome that it came out well with German dry yeast. I’ve had the worst luck with American recipes and German yeast! And good to know that that mix of wheat and spelt worked out well. :) Thanks so much for your feedback! I know you mention that this bread won’t work with Whole Wheat Flour? But I was wondering how much more liquid to add if I wanted to use whole wheat flour? Thanks! :) Since I haven’t had success with using whole wheat flour in this recipe (I’ve tried), I’m not sure how much liquid you’d need. I recommend using this recipe, and adding some cinnamon and a cinnamon swirl. I hope that helps! Hi! Just found this recipe and YUM! However my bread didn’t rise when baked. I was really careful not to over mix the spelt. It rose beautifully on the counter but come time for the oven it actually reduced in size. Any tips? Luckily it didn’t really effect the taste! Yum! I LOVE cinnamon bread, but hate raisins. Sadly the the whole grain store bought cinnamon bread (Ezekiel, etc) all contain raisins. I can’t wait to try your recipe, sans raisins, I think I’ll decrease the brown sugar though. It turned out amazing! And I found it very easy to make. I could not find whole spelt flour in the store so I used whole grain flour specifically for baking bread and we loved it. My house smelled so lovely of fresh bread and cinnamon. If you do decide to use whole grain flour, I used a total of 3 cups. I make all my bread in a bread maker. Has anyone tried to make this in a bread maker? 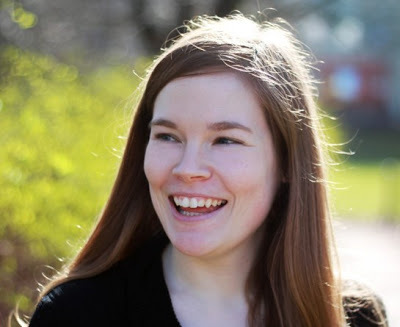 Hi Lise! I’m sorry to hear that it came out crumbly. It’s definitely not typical of spelt bread or this loaf! Did you follow the recipe exactly or did you make some changes? If it came out crumbly, it sounds like perhaps there was too much flour or that it was in the oven too long. So sorry I couldn’t be more of a help! Well, I’m glad to hear that it’s not typical of spelt breads, because I love the flavor of spelt flour! Perhaps I left it in too long – the last loaf I made (in a crockpot, long story) wasn’t totally done and I had to stick it back in with a piece missing ;). So maybe I’m erring too far the other way! Thanks for the suggestion! Your first statement is so right! It’s not hard to sub 50% whole grains in place of white flours but all of it? So hard! I LOVE cinnamon raisin bread and of course I’m thrilled that you used all whole spelt flour for this. I have to try this! Delish! I can just imagine a slice of this toasted with a bit of butter. Oh how great your house must have smelled! I need to find where I can get Spelt. 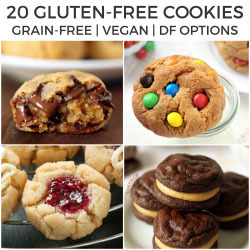 I do like whole grain goodies, especially bread – so I want to try this! I have to get whole spelt from the local natural food store. I bake with spelt and have discovered that not only does it require about an extra 1/8 cup per 1 cup as a conversion from wheat, it only requires one rise. Once you get the ratio down, you should be able to substitute spelt in any wheat recipe. I am gluten intolerant but because spelt is gluten friendly (it still has gluten) I can eat it! This looks so delish! That swirl is seriously calling my name! I love baking with spelt flour! This loaf looks amazing, girl! Thanks, Ashley! :) And agreed – spelt is awesome! Your bread looks gorgeous! Great job! Wow x10000!! A non-fussy, EASY, whole wheat bread recipe. Ahhh you’ve done it Erin! It looks so soft, so cinnamon-y, and I love all the raisins. 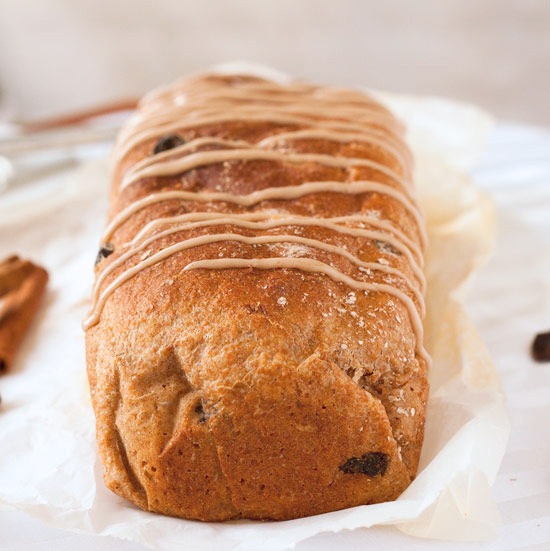 Cinnamon Raisin bread is my favorite kind and I’ve never seen a whole wheat version before. Pinning this one! Thanks for pinning! And thanks for the nice comment. :) I have another version of whole grain cinnamon bread but it’s way more complex. So happy to have found this one! I need to try a spelt flour, and this bread will be a good ocasion. Haha. I do the same with fresh bread. So you’d better not make this. ;) And how do you not like it in cakes and stuff? You can hide the flavor there! This is awesome, I love the swirl! But spelt tastes even less whole grainy! At least to me. Whole wheat tastes pretty healthy, in my opinion. Spelt? Less so. :) I hope you and your husband will like spelt! You could always try easing the family into it. I did it by starting with all white spelt, then I introduced half white spelt and half whole spelt. Finally, I went to whole spelt. Each level was a little more dense, but when using the correct amount of yeast, it will still be pretty light in comparison to other whole grain breads (excluding store bought, those are always the lightest from processing). Also, spelt has a nuttier flavor that wheat so spelt bread tastes delish! Oh, this bread looks so good! Love the cinnamon swirl and your maple-cinnamon almond butter suggestion sounds perfect! I’ve never used spelt, so I’m glad for your little Spelt101 in here :) This bread looks amazing, bonus points for being vegan and pretty low on oil. Think it’s safe to say this is going to be my first venture into using spelt! Mmmmm…this sounds great! I totally agree, whole wheat recipes are hard to find. I like the fact that this one is not difficult to make. Thanks, Holly! And yeah, most whole grain bread recipes taste too healthy. I don’t like that at all! This sounds absolutely perfect! Love the spelt flour in there. I need to bake with it more!